Presentation of the ETHNOGRAPHIC ATLAS OF ROMANIA (Volume 1 – 2004) to the Tozzer Library (anthropology) at Harvard University. 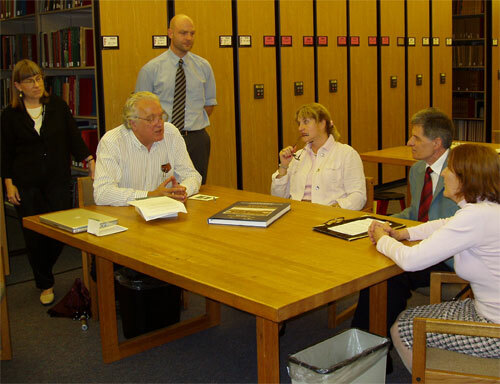 Prof. Carl Lamberg-Karlovsky (seated left) and library staff receive Dr. Ion Ghinoiu (rt ctr), editor/ cordinator of the Atlas and Dr. Alina Ciobanel (rt) both of the Ethnography and Folklore Institute in Bucharest, Romania. Seated center is Katherine Dimancescu sponsor of the Romanian ethnographers visit to the United States.